Researchers develop tissue-engineered model of human lung and trachea. Lung disease causes more than 200,000 deaths annually in the United States. Although the lung is generally considered slow to respond to disease and injury, it does undergo regenerative processes, most of which are not fully understood. Building an understanding of these processes might lead to harnessing these innate mechanisms to help damaged lungs repair. Now, a study from researchers at Children’s Hospital Los Angeles develops a tissue-engineered model of a human lung and trachea which contains the diverse cell types present in the human respiratory tract. The team state that this is is a proper three-dimensional model in which the disease process can be studied. Earlier studies from the lab developed tissue-engineered small intestine (TESI) and showed that this regenerated tissue was functional and contained all of the key components of the native tissue. Therefore, the group hypothesized that multicellular epithelial and mesenchymal cell clusters or lung organoid units (LuOU) could be transplanted to recapitulate proximal and distal cellular structures of the native lung and airways. The team explain that the tissue which grows from this strategy is termed tissue-engineered lung or TELu. The current study shows that when LuOU were generated from whole lung, the tissue-engineered lung (TELu) contained key epithelial and mesenchymal cell types. The current study employed a similar strategy to recapitulate the human lung and trachea, transplanting stem and progenitor cells on biodegradable polymer scaffolds. Results show that transplanting regionally specific lung tissue from mice and humans generates TELu with typical location-specific tissue markers such as particular alveolar or air sac cells in the distal TELu or tracheal epithelial cells organized with cartilage and ciliated appendages for proximal lung. Data findings show that TEtrach, or tissue-engineered trachea, grew from the most proximal cells. 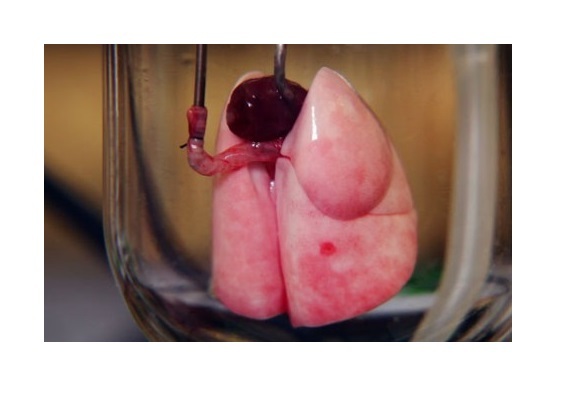 The researchers state that transplantation of LuOU resulted in the growth of tissue-engineered lung that contained the necessary cell types consistent with native adult lung tissue and demonstrated proliferative cells at 2 and 4 weeks. They go on to add that this technique recapitulated important elements of both mouse and human lungs featuring key components of both the proximal and distal lung regions. The team surmise that their data support a model of post-natal lung regeneration containing the diverse cell types present in the entirety of the respiratory tract. For the future, the researchers state that understanding lung regeneration will allow several steps forward in studying advanced stages of disease in order to, hopefully, deliver future human therapies. Engineered rat lungs in a bioreactor at Dr. Harald Ott’s lab in Boston. Credit: National Geographic Explorer.